Gradient ceramic on metal surface and metal film on ceramic surface have very important application prospects in the material engineering development. 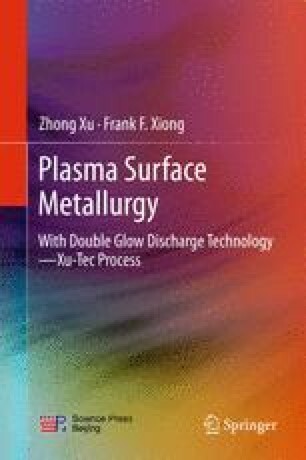 This chapter introduces some engineering research achievements of the Xu-Tec process for forming gradient ceramic layers on the surface of carbon steels, as well as metallization of titanium alloys on the surface of a variety of ceramics such as TiSi30, Si3N4, ZrO2, Al2O3, and diamond. As a special example, forming a gradient luminescent functional ceramic Er–ZrO2 layer on the surface of titanium alloy by the Xu-Tec process is presented. In addition, this chapter describes the experimental device, processing procedure, and technological parameters of ceramization and metallization. Their mechanical properties of the formed surface ceramic and metal layer, such as surface hardness, wear and abrasive resistances, and adhesion enhancement, are presented.